It is strikingly moderate. Contrary to Corbyn's hard-left reputation, there is nothing about abolishing the monarchy, nationalising the FTSE 100, or changing the national anthem to The Red Flag. In policy terms, it's plausible the Labour Party could get behind this. Most of it would not have been out of place in Ed Miliband's 2015 manifesto. Item 5 is more ambitious than anything Miliband proposed, but it's strongly in tune with Labour tradition. ... highly progressive relative to this same ‘unchanged policy’ baseline, significantly reducing the incomes of richer households and increasing those of poorer ones [...] Labour’s measures have particularly benefited low-income families with children and pensioners receiving tax credits or means-tested benefits. The difference is one of presentation, rather than practice. New Labour did its best to avoid talking about tax rises and benefit increases. Nonetheless, a policy implemented by Blair and Brown can hardly be described as radical leftism. Could it be sold to a sceptical electorate? It wouldn't be easy; but depending how the details were fleshed out, it might be worth a try. At least it tells a clear story, in contrast to Miliband's fumbling efforts in 2015. As a parent paying eye-watering sums for nursery care, I'd be particularly interested in item 5. This raises a question: What the hell is Labour fighting over? Smith and his allies, including the 80% of Labour MPs who voted no confidence in Corbyn's leadership, have a clear answer: Jeremy Corbyn is not competent to serve as Labour leader or win an election. This is harsh, but it appears they have a point. MPs such as Thangam Debbonaire and Lilian Greenwood have given astonishing accounts of Corbyn's ineptitude at running an opposition party. Greenwood says she quit as Shadow Transport Secretary out of frustration at being continually undermined; Debbonaire that Corbyn appointed her shadow arts secretary without her knowledge, while she was undergoing cancer treatment, and then took six weeks to clarify the situation. The late Jo Cox spoke out against Corbyn, not long before she was murdered. None of those MPs could be reasonably described as a right-wing troublemaker. Greenwood was a trade union official for two decades, and Debbonaire had a career fighting against domestic violence before she became an MP. Cox had an exemplary record of fighting for the less fortunate, before her career was tragically cut short. The message can't have been easy for Corbyn to hear. Until last year, he never seriously expected to be Labour leader; but it must be crushing to be told you're no good at your job. The counter-narrative of Corbyn's defenders is something like this: Corbyn's opponents are part of a free-market, Blairite cabal; they never accepted his right to lead the party; they oppose the radical new policies Corbyn wants to promote. Until recently, Corbyn has been extremely vague about what these policies might be. Now he has finally given some details. I look at them and think: Is that it? This is what sparked off an ideological coup? This list of eminently respectable social democratic measures? I simply do not believe it. Recall the days after the European referendum, when Corbyn suffered mass shadow cabinet resignations and a vote of no confidence. He had to make a decision as to whether he should stay or go. At this point, Corbyn had leverage. The rebels wanted to avoid exactly the situation we are in now. The deputy leader Tom Watson, a man with his own mandate from the party membership, stood ready to broker a compromise. Corbyn could have extracted policy concessions in exchange for stepping down, and accepting some sort of senior role such as party President. If this ten-point list represents what Corbyn really, truly wants from the Labour Party, it would have been fine. It would not have been difficult to get the rebels to sign up to it. Nothing in the list would be all that objectionable, to more than a handful of Labour MPs. Paranoia: In the face of all the evidence, Corbyn didn't trust Labour to commit itself to this very reasonable list of policies, without himself standing over them as leader. Wider agendas: There are a few conspicuous absences from Corbyn's list, such as his belief in nuclear disarmament. For the time being, Labour policy (set by the party conference, not just the MPs) is to retain nuclear weapons, but he may be hopeful of changing that with time. The same may apply to other left-wing ideas he has long cherished. Ego: Corbyn has a position of importance such as he never dreamed of. He draws huge, enthusiastic crowds to rallies. He is famously modest in his personal style, but he's still a human being and a politician, so he must be reluctant to give that up. Principle: The members voted for him by an overwhelming margin. They made him the leader, so he should stay the leader. The last item is all well and good. Corbyn does indeed have a responsibility to the members who voted for him. But he also has a responsibility to lead Labour in Parliament; and you can't lead those who refuse to follow. Corbyn had a chance to get what he says he wants: A Labour Party firmly committed to his ten-point policy plan. He chose not to take it, because that is not everything he wants. He wants control, he wants adulation, and he wants all of his policy ideas adopted, not just most of them. 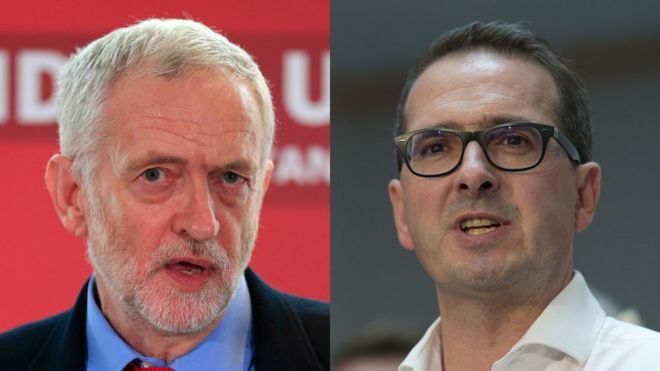 Corbyn's decision will likely ensure none of his policies are enacted by a Labour government, because there will not be a Labour government while the party is absorbed by internal feuding. No matter who wins the leadership contest, I am not confident that will change in the foreseeable future.